The pancreas (PAN-cree-us) is an organ that sits in the left side of your belly. The pancreas has two main functions. It makes digestive enzymes (proteins that break down food) and hormones that regulate blood sugar, such as insulin. Pancreatic (PAN-cree-at-ick) cancer occurs when abnormal cells grow uncontrolled in the pancreas. 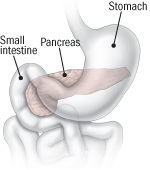 Most pancreatic cancers occur in the part of the pancreas that produces digestive fluids. A small number of pancreatic cancers occur in a part of the pancreas that helps regulate blood sugar. This type of cancer is called either an insulinoma or a neuroendocrine tumor.